She was built in 1935 and named “The Omar.” She was created as a working boat, a 2-deck tug for the Ohio River Company. Mainly made of steel, she is 207 feet long, 36 feet wide, and 37 1/2 feet high. Her oaken paddlewheel, rebuilt in 1980, is approximately 32 feet in diameter. It was originally powered by two Marietta compound stem wheel engines that required 25 to 75 tons of coal a day. These engines produced 1,000 horsepower. For 25 years, “The Omar” pushed barges up and down the Ohio River. Then in 1962, the Ohio River Company presented her to the State of West Virginia for use in its Centennial celebration. That marked the end of her working days and the beginning of her “stage” career. She was converted from a tug to a showboat without losing her charming riverboat features. The main deck, lounge and second deck captain’s quarters were preserved. The original galley area and crew’s quarters became the theater. By raising the pilothouse, a new third deck was created, providing theatre balcony and museum exhibition space. Crowning the “Rhododendron,” renamed for the state flower, was the pilothouse with its captain’s control wheel and a bird’s eye view of the river. She was moored at Riverfront Park, entertaining the public with plays in the summertime and providing an appropriate focal point for the handsome park. 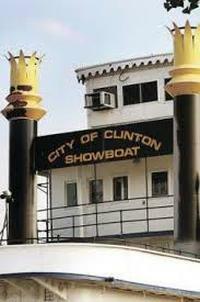 Late in 1983, the Clinton Park Board and the Showboat Advisory Board decided it was time to keep the moneys paid to the summer theatre companies in Clinton. An Artistic Director was hired, and the Showboat Players was founded. The summer of 1984 found the first group of Showboat Players performing in the Lillian Russell Theatre. The fall of 1988 saw the incorporation of a new nonprofit group – Clinton Area Showboat Theatre. From the summer of 1989 on, CAST ran the theatre. The City of Clinton also received a grant from the State of Iowa to remove the boilers and convert the front portion of the main deck to a large open room for a waiting area. In the spring of 1991, riverboat gambling came to the Clinton area. The first deck of the Showboat was completely rebuilt. All small motors, generators, pumps, etc. were removed. Mississippi Belle II built their new ticket office in the forward portion of the first deck, while the City of Clinton built in a new box office for CAST and a concession stand. The first deck, the theatre, and the dressing rooms became completely air condition and heated. With Mississippi Belle II, the Iowa Department of Criminal Investigation, and the Iowa Gaming Commission moving from their former locations on the Showboat, CAST had complete use of the Showboat. The box office was moved to the former area of the Iowa Gaming Commission, and the Artistic Director’s office along with the Production Stage Manager’s office were moved to the area vacated by the DCI. 2006 brought with it some necessary changes and upgrades to the facilities with help from the Vision Iowa fund. The whole Showboat received new fire system which included an alarm, heat sensors in the lobby, offices, house, greenroom and shop, as well as new fire exit signs. The old theatre air conditioners were removed, and two new units were installed on the roof. The exterior of the boat and the paddle wheel were given a paint job.